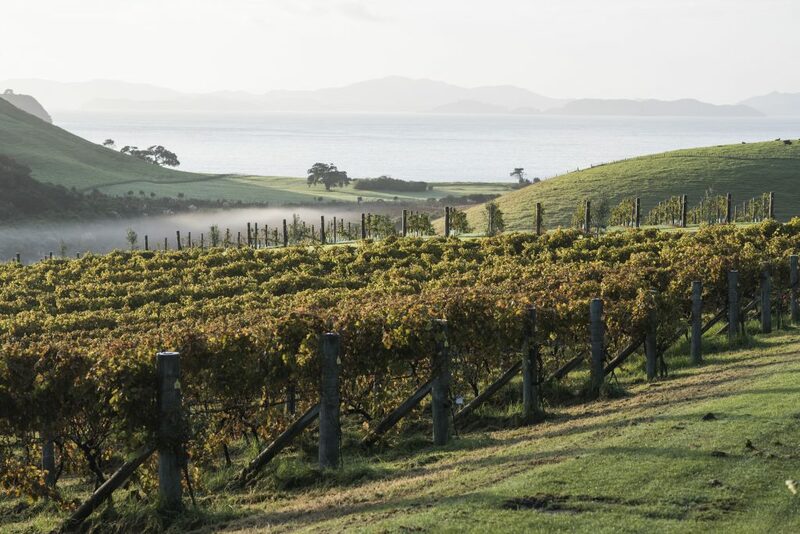 Founded in 2007, the vineyard covers nine hectares on a gently undulating slope overlooking Wairoa Bay. The vineyard’s close proximity to the water means it enjoys a regular sea breeze, which keeps the vines dry, and coastal soil that imparts unique mineral flavours. These uncommon factors are complimented by The Landing’s location within a rain shadow, protected by the hills from prevailing winds. The vineyard sits, in essence, within a unique microclimate. To suit the special nature of these surroundings, new ways forward in production have been developed. Vines are planted with wide spacing to welcome the sunshine, and there is no irrigation, meaning the roots have to push deep into the soil. This helps to balance the effects of both rain and drought, as the further the roots go into the soil, the more consistent the water source and nutrients become. As a result, the wines hold flavours and levels of complexity not seen before. The Landing Wines currently produce Rosé, Syrah and Chardonnay. Plantings have expanded over recent years to include Sangiovese, Pinot Gris, Montepulciano, Malbec, Cabernet Franc and Merlot. Processed at local winery, Marsden Estate, by award-winning winemaker Rod McIvor, the wines are then cellared on the property at The Landing.